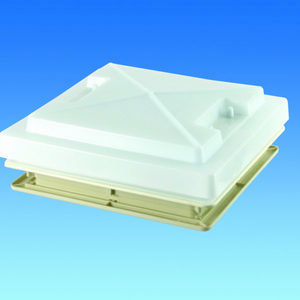 Multidirectional MPK roof light with opaque, flexible double skinned dome and beige frame. Telescopic arms allow the rooflight to be opened to any side. The dome skins have spaces between, to guarantee free airflow that cannot be reduced by snow weight. White woven fabric flyscreen on beige plastic frame.